We've seen several machines from Acer's Aspire Timeline range now and every model has impressed us. 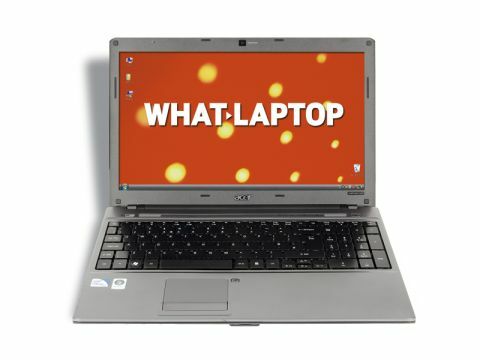 The Aspire 5410T offers excellent portability, despite the 15.6-inch screen. The display features the same 1366 x 768-pixel resolution as most of the other laptops in this price range, with detailed images on offer. Colours are slightly washed out, but LED backlighting helps to provide bright images and consumes less power than a traditional fluorescent panel. Power-efficiency is central to this laptop, with mobility and battery life being key factors. Acer has fitted a CULV Intel Celeron processor and, along with the LED screen and integrated Intel graphics card, it helps to offer an impressive 354 minutes of mobile use from a single charge – bettered only by the Sony VAIO VGN-NS30E/S. It comes at a price, however, as even with 3072MB of memory it struggled to perform and we found it to be slow during daily use. It took longer than rivals to start and also slowed down when running multiple applications. It's fine for general office tasks once up and running, however, and is also capable when browsing the internet or just watching the occasional film. The keyboard offers excellent quality, with keys that move smoothly and with a decent amount of travel. It takes some getting used to, with a flat surface that can make it tricky to distinguish between keys, but a fast typing action is very easy to achieve. The keys are lifted high off the board itself, however, so it's easy for dirt and dust to get trapped beneath them. Build quality is solid, with an aluminium lid that helps to protect the screen. The chassis is very thin, but it's also one of the toughest, and is easily capable of withstanding the daily commute. It's a well-equipped laptop when it comes to ports and, like the Packard Bell Bell EasyNote TJ65-AU-010UK, you'll find four USB ports for peripherals, and VGA and HDMI ports for connecting analogue and digital displays. At 250GB, the hard drive offers plenty of storage for work and media files, with a multi-format DVD rewriter for backing up your data on to blank DVDs and CDs. 802.11g Wi-Fi and Gigabit Ethernet provide networking options. There is also a 4-in-1 memory card reader, making it easy to transfer files between this laptop and other compact digital devices. The performance of the Aspire 5410T-723G25Mn may not be the best, but this machine represents truly outstanding value for money, with a design that puts far more expensive laptops to shame. If you need a large, yet highly portable, machine, then look no further.